Hailed by John le Carré as “an act of courage on the part of its author” and singled out for praise by the leading medical journals in the United States and the United Kingdom, The Body Hunters uncovers the real-life story behind le Carré’s acclaimed novel The Constant Gardener and the recent feature film based on it. “A trenchant exposé . . . meticulously researched and packed with documentary evidence” (Publishers Weekly), Sonia Shah’s riveting journalistic account shines a much-needed spotlight on a disturbing new global trend. Drawing on years of original research and reporting in Africa and Asia, Shah examines how the multinational pharmaceutical industry, in its quest to develop lucrative drugs, has begun exporting its clinical research trials to the developing world, where ethical oversight is minimal and desperate patients abound. 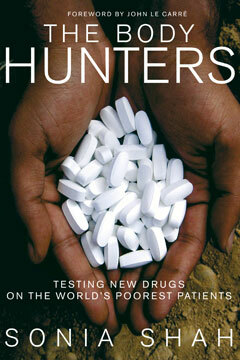 As the New England Journal of Medicine notes, “it is critical that those engaged in drug development, clinical research and its oversight, research ethics, and policy know about these stories,” which tell of an impossible choice being faced by many of the world’s poorest patients: be experimented upon or die for lack of medicine.